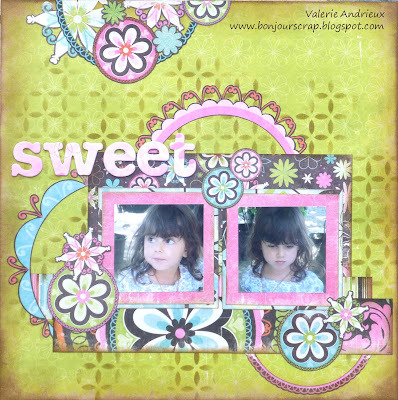 I wanted something bright and flowery for this layout, and I the perfect papers were waiting for me in my old stash... a Tiffany's paper pack by We R Memory Keepers, used several time already, but still loved. I just added some Walnut stain distress ink (Ranger) over a stencil (Prima Marketing), but everything else came from this paper pad. This is a terrific layout and I've pinned the sketch to try to play along as well!! Love all your details and beautiful layering! Such a great happy page!